• Improve the standard of rugby league performance in our local junior playing ranks. • Provide a rugby league education and potential pathway for young footballers in the local footprint. Under the direction of Mackay Cutters Head Coach Steve Sheppard and Academy Co ordinator Scott Thorburn, the Mackay Cutters provide opportunities for young players 12 to 18 years old (including females). Coaches work intensively with squads of high performing juniors from the local area. The U16 squad (25-30 players) is announced in November each year and commence pre-season in early December and January for the younger age groups. This includes rigorous fitness testing, on field skill development and strength and conditioning. During the pre-season all junior players get the chance to train and interact with the Intrust Super Cup squad and coaching staff at the Mackay Cutters. Our Under 16 squads get the opportunity to test themselves in the highest standard of competition in the state. Our Under 13-16 teams and girls teams prepare for the NQ Championships in the hope of earning representative honours. The McDonald’s Mackay Cutters Academy allows young footballers the opportunity to stay in Mackay and continue their rugby league education. History tells us that Mackay is a breeding ground for great rugby league talent and too often this talent is lost to North/South Queensland and Interstate. With the creation of a sustainable Junior Development Program the Mackay Cutters can work closely with junior players in clubs and schools to ensure players, coaches and teachers remain up to date with modern coaching practice. As junior players progress through the age group ranks Mackay Cutters staff work closely with junior clubs to ensure talent is identified. Opportunities for coach development are also afforded to all clubs to ensure quality instruction. 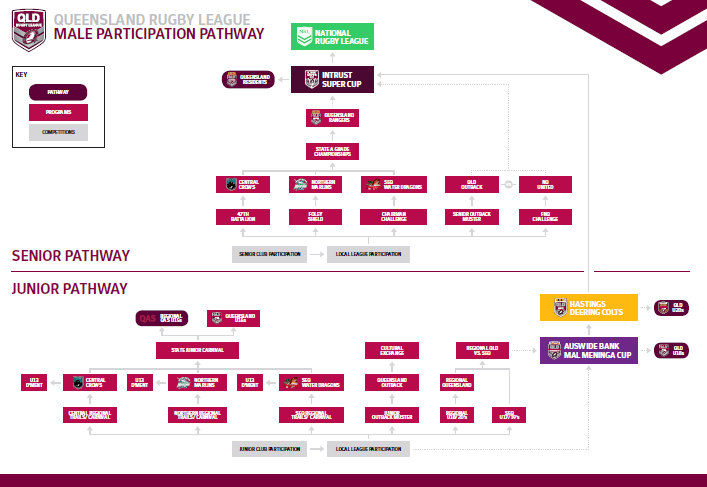 In return, the Mackay Cutters are able to base all Junior Development coaching from the Junior Rugby League facilities and BB Print Stadium Mackay. Session 1 - Sunday, February 24, 9.00am – 11.30am. Session 3 - Sunday, March 24, 9.00am – 11.30am. Session 4 - Sunday, April 28, 9.00am – 11.30am. All sessions to be held at MJRL grounds Mackay.